Immigration shelters in the El Paso area are trying to expand capacity as the federal government released hundreds of migrants this week with no place to go and without warning. EL PASO – Churches, volunteers, hotels and the goodwill of the public at large. That’s what it’s going to take – all of these entities working together – to prevent hundreds more asylum-seeking, undocumented immigrants from being released by the federal government onto the streets of this border city with no place to go other than a bus station parking lot. The message came Thursday from Ruben Garcia, the director of El Paso’s Annunciation House, a prominent local shelter which has for years taken in migrants seeking refuge in the United States after they are released from federal custody. His nonprofit was left scrambling this week after Immigration and Customs Enforcement abruptly changed its procedures late Sunday, two days before Christmas. Normally, ICE reaches out to Garcia and alerts him when a large group is going to be released so he can coordinate their travel to one of the Annunciation House’s hospitality centers. “It is utterly normal and common, we have been receiving families that have been released by ICE for the last five years,” he said. On Sunday, without warning, ICE released hundreds of migrants at the local Greyhound station without alerting Garcia. ICE was unable to respond to this story – as it did not respond to a previous request this week because the public affairs office is closed due to the partial government shutdown. “We are unable to respond to media queries during this period because we are prohibited by law from working. If you still require a response, please resubmit your query upon the government re-opening,” the agency's spokesperson said in an auto-reply email. Garcia said he and his staff worked until the pre-dawn hours Monday until all the families ICE dropped off Sunday evening – more than 200 – were able to find a place to stay. But ICE continued dropping off migrants for the next few days – leading to a four-day total of between 1,600 and 1,700, Garcia said. The daily bed space available at the Annunciation House’s network of centers is hard to pinpoint because it depends on how quickly the migrants who have recently been provided housing are able to begin the journey to their final destinations. During the latest surge of families migrating to the United States to seek asylum, Garcia said the his organization and its partners have been able to provide space to about 2,200 people a week. But the increasing swell of unauthorized migration has led Garcia to work to expand the group's network to at least 3,000 beds a week in order to avoid what happened on Sunday and continued through the Christmas holiday. Garcia said he understands the government has limited space, is regulated by law on how long it can hold migrants and that the infrastructure currently in place is designed to hold single men, not families. But he said families with young children spilling on to the streets in the middle of a West Texas winter is not the answer. Garcia credits the people of El Paso and elsewhere for stepping up and doing their part to help in response to ICE's unexpected change in policy. 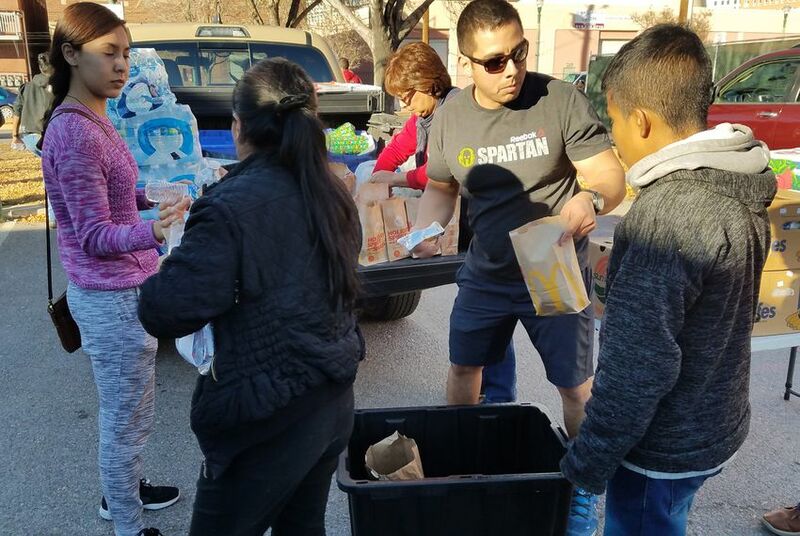 On Christmas Eve, volunteers flooded a parking lot across the street from one of the Annunciation House’s locations to offer food, blankets and stuffed animals to the families who had been released. They included outgoing El Paso Congressman Beto O’Rourke and his staff and El Paso County Judge Ruben John Vogt. El Paso Mayor Dee Margo has also volunteered at other locations, Garcia said. But the community at large needs to remain engaged and willing to help as the region is certain to continue to draw more migrants, the majority of whom are from Central America, during their unexpected pit stop to the border regions in Texas and New Mexico. So far, the vast majority of the effort to assist the migrants has come from donations, including about $150,000 a month for hotel space during the recent surge, Garcia said. At some point, he said he may consider asking the city of El Paso to provide additional resources to help keep an increasingly difficult situation under control. The city already provides migrants seeking the help of groups like Annunciation House use of city buses for travel and police for safety, according to a city press release. But if ICE starts releasing even more migrants unequipped to find their own shelter or reach family elsewhere in the country, local officials may feel a need to provide more support. A court ruling may allow migrant families to be held indefinitely. These families know what that could be like.